In April 2012 I started my healthier lifestyle journey so that I would feel better and to prevent heart disease from attacking me. February is American Heart Health Month and I am celebrating it by being healthier and eating Quaker Oats! Do you have a family history of heart disease? What are you doing to take care of yourself? How about your family? I have made some lifestyle changes over the past 10 months to get my heart healthy. 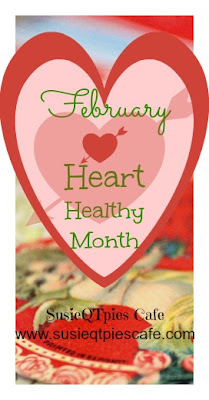 If you haven't thought much about your heart health, this is the month to do it. There are many things that can be done including eating whole grains. Several times a week I eat a hot breakfast of Quaker Oats to give my day a kick start. I also exercise at least 5 days a week. What are you doing for your heart? Check out www.GoRedForWomen.org for more heart healthy tips and guidelines. The below video is of Quaker and heart-throb chef Fabio Viviani. They are working together to energize and inspire women to take care of their hearts for American Heart Health Month. By starting now you will develop good habits to keep you going all year long. Join in the fun and participate in the Epic Hot Breakfast Twitter sweepstakes. All you have to do is watch Quaker’s Epic Hot Breakfast video on YouTube.com/Quaker and then share it on Twitter with the hashtag #QuakerLove between February 14th through 28th. Random picked Grand Prize winner will win a get away spa treatment and dine at Siena Tavern in Chicago. Fifteen other participants will also be randomly chosen to receive the "Ultimate Hot Breakfast" prize pack! Want even more fun for Heart Month? Join the Quaker Heart Heath Twitter (click to RSVP) party Tuesday 2/19 from 8-9 PM EST hosted by @ResourcefulMom and @FabioViviani. Use the hashtag #QuakerHearts to participate in the Twitter Party. Follow Quaker social channels to keep up with the fun this month! This is a sponsored post which I was compensated to write but my own tasty opinions, as always, are written here.